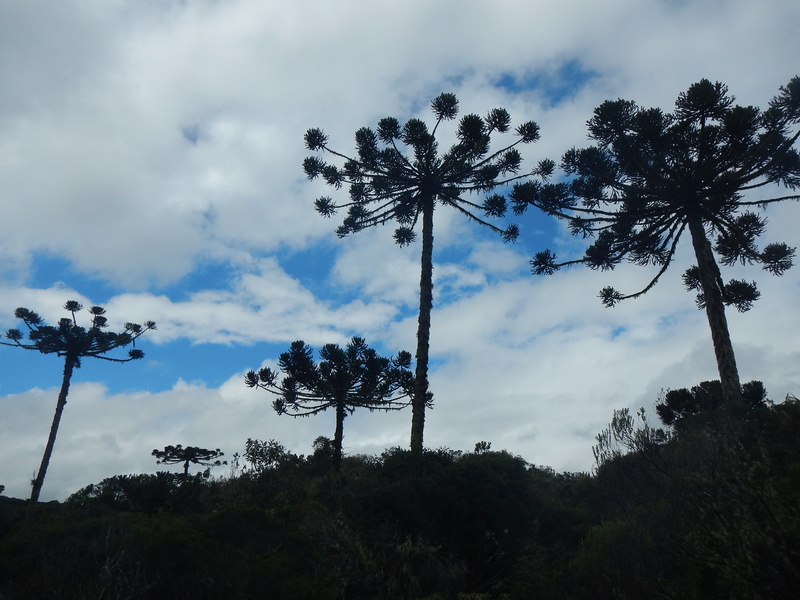 While I was spending a few days in the Serra Gaucha town of Gramado, I knew that I wanted to visit the Cânion Itaimbezinho located within the Parque Nacional de Aparados da Serra. 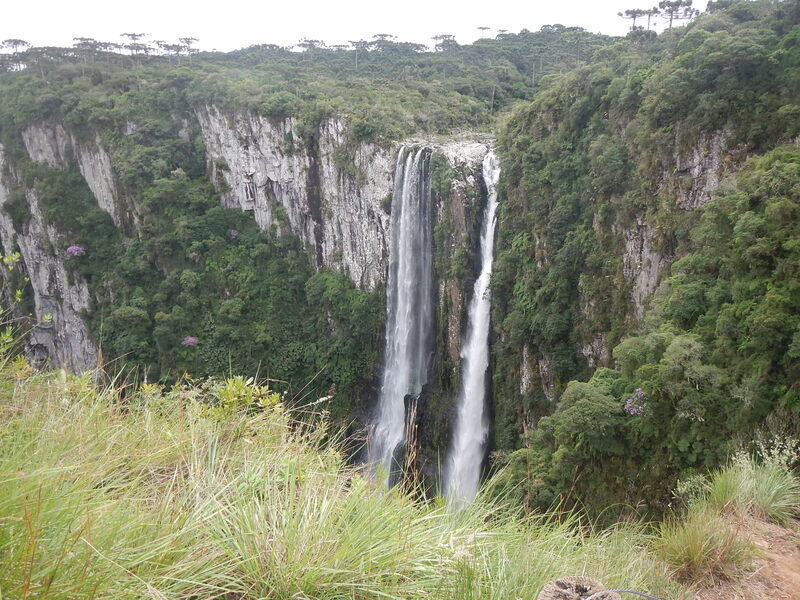 The national park is situated on the border of Rio Grande do Sul and Santa Catarina, close to the town of Cambara do Sul, which is some distance from Gramado. “Itaimbezinho” means “cut rock” in the indigenous Tupi-Guarani language. Actual cutting of these rocks took place nearly 130 million years ago through an eruption of basalt lava when the continent of South America split away from Africa. The results of this geologic incident are still evident in the canyon’s deep and dramatic escarpments. The canyon is one of the largest in Brazil, as deep as 700 meters, 5.8 kilometers in length, and as wide as two kilometers in places. 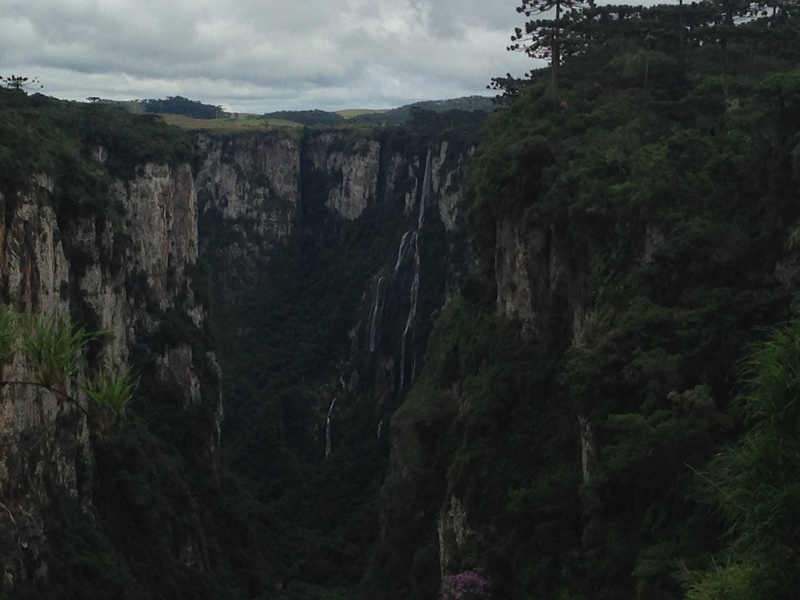 It was difficult, at first, to find information in English at Gramado’s tourist office about hiking trips to the national parks, but ultimately I was able to arrange a full day trip to the Cânion Itaimbezinho through Brocker Turismo for R$135. The tour was completely in Portuguese, but there was a really nice couple from São Paulo on the tour who spoke some English and were able to do some translating for me. It was raining during most of the ride from Gramado to the national park, but the weather at the canyon cooperated for the most part during the day. If you’re visiting, don’t place too much stock in the local weather report because the canyon can often have its very own weather systems. Our tour guide drove us through miles of undulating farmland and through the sleepy, windswept town of Cambara do Sul, a place that resembles the Wild West, as gaúcho culture sometimes does. We turned off onto one of the bumpiest roads I’ve experienced here in Brazil, unsealed, riddled with holes and not somewhere I would want to be driving after heavy rains. 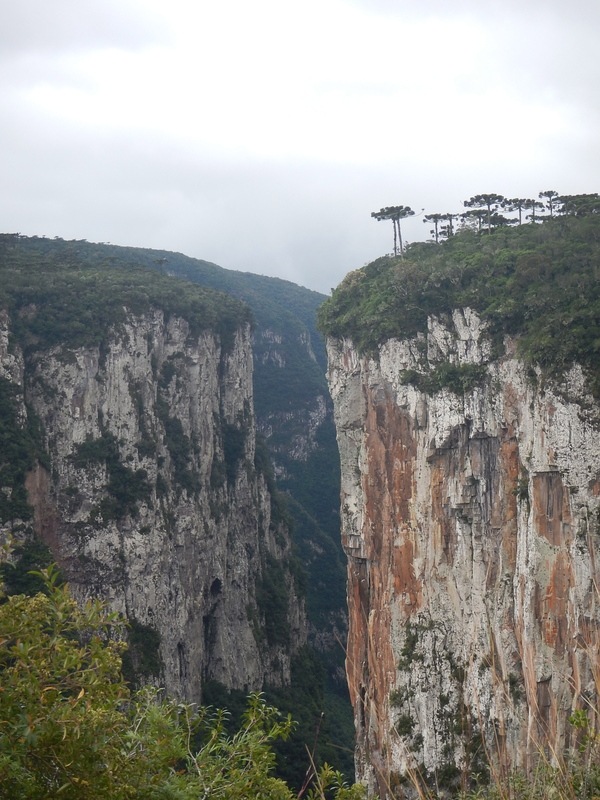 Eventually, we reached the national park, paid our obligatory R$6 entrance fees and commenced our hikes. We started with the Trilha Cotovelo (Elbow Trail), an easy trail of about 3 kilometers. Even though it was already late summer in Brazil, some flowers still displayed their colorful petals. 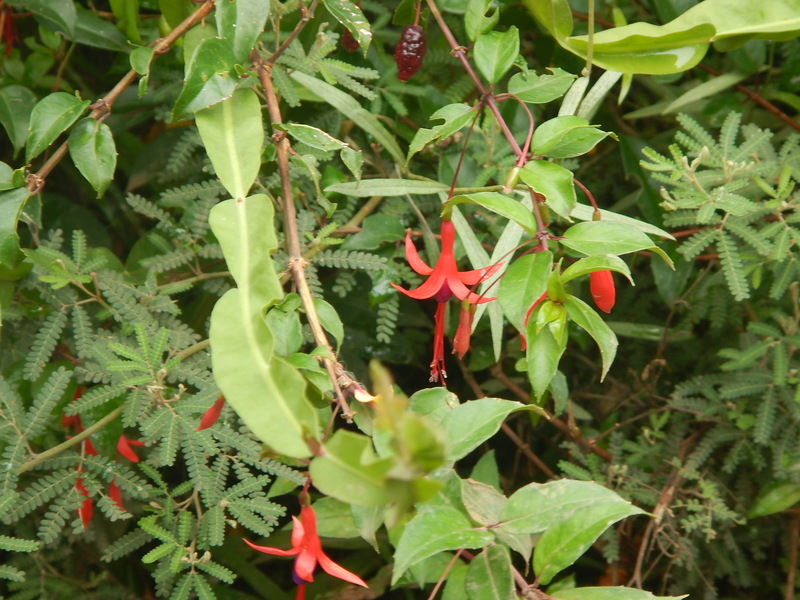 One of the notable flowers I remembered was the brinco-de-princesa (princess’s earring), a hybrid species that is a symbol of Rio Grande do Sul. 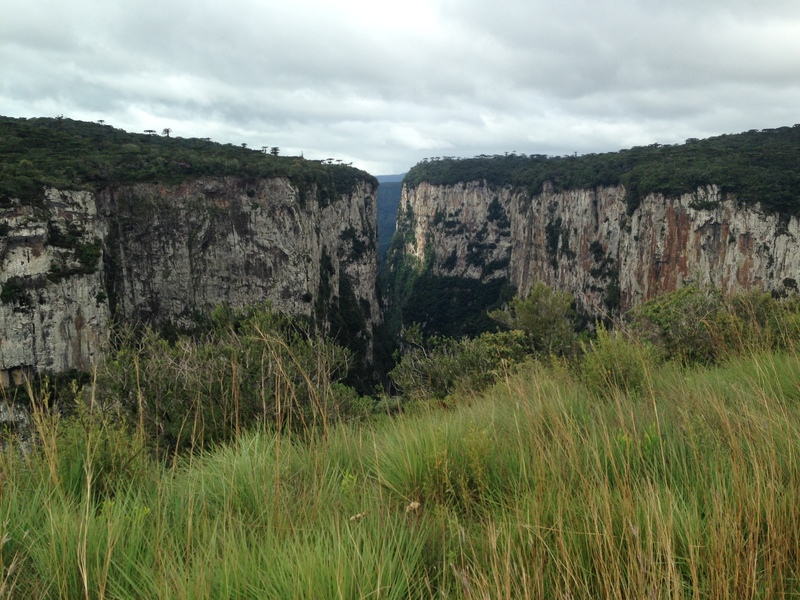 The canyon is truly one of the most spectacular natural features I have seen so far in my travels in Brazil. As we walked through the woods, we could hear the sound of water and then eventually an unbelievably deep gorge leading off into the distance. The rocky, multi-colored walls of the canyon are flecked with vegetation. The tops of the canyon are carpeted with green trees, including the distinctive araucária pine trees. The walls of the canyon are incredibly sheer. Barricades all along the trail warn you from walking too close to the edge. Our tour guide had each of us shout and whistle into the canyon to hear our echoes making their journey off to the ocean, which is not too far from the park. The Trilha Cotovelo goes by the Véu de Noiva (Bridal Veil) waterfall where the Rio Perdizes descends into the canyon. We were actually able to get a better view of the falls from the second trail we took that day. Some of the cascades that stream down the edge of the canyon actually disappear into mist before reaching the canyon floor. After having lunch, we followed a shorter trail around the edge of the canyon known as the Trilha do Vértice. 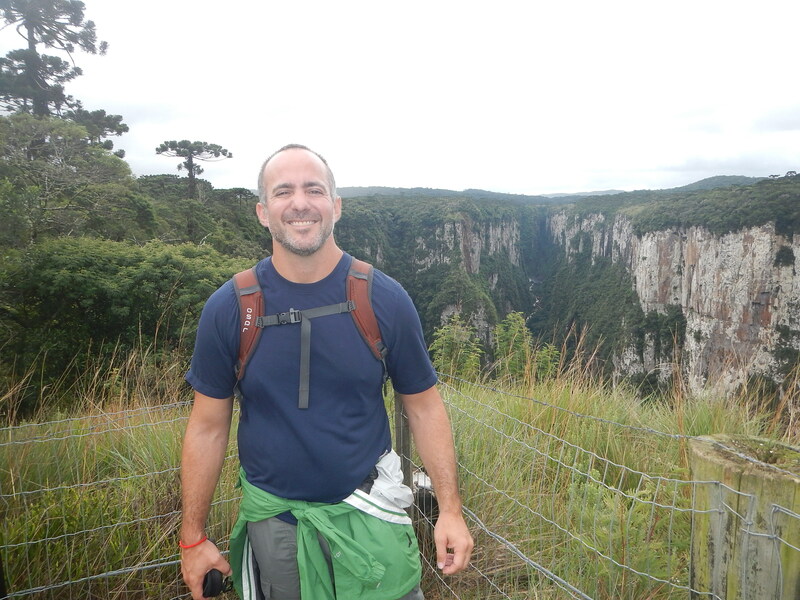 This trail goes from the visitor center around the edge of the canyon to another waterfall, the Cascata do Andorinhas. The day had been somewhat overcast, but along this trail there were some intermittent moments of blue sky. 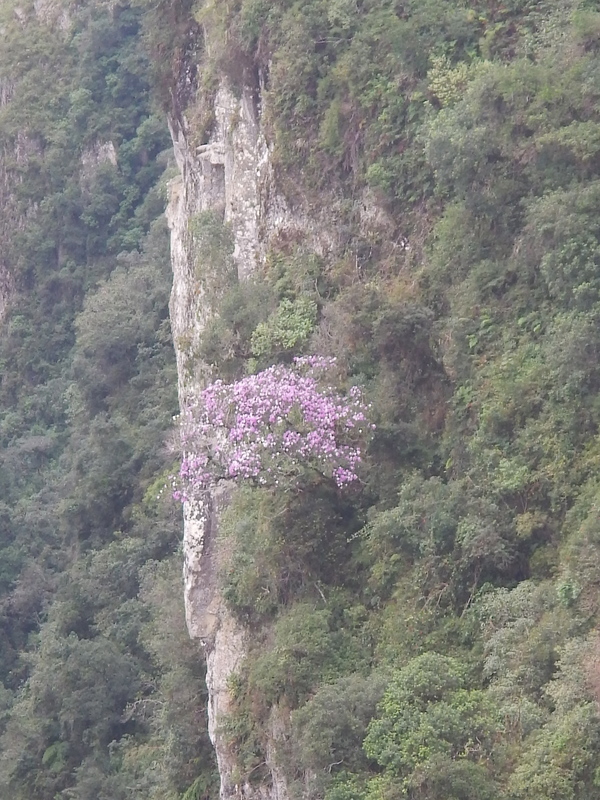 I managed to get a few pictures of araucária trees and flowers growing on the precipituous canyon wall. There is a third trail that you can hike in the canyon, the Trilha do Rio do Boi, a long and arduous journey of 8 kilometers which can last as long as 7 hours roundtrip. This is the only trail that allows access to the bottom of the canyon and follows the Rio do Boi at the canyon’s bottom. If I ever return to the Cânion Itaimbezinho, I would like to try hiking this trail. Overall, I was very happy that I made the effort to have this adventure in this spectacular place. If you enjoy hiking and natural beauty, this is definitely a place you need to see if you happen to be traveling through southern Brazil. Have you visited the Cânion Itaimbezinho or the national parks close to Cambara do Sul? What was your experience like there? We go there tomorrow. Thanks for your great tips.